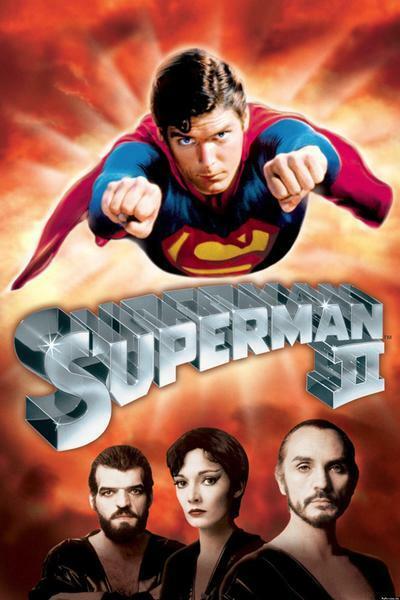 This was probably the Superman movie I remembered the best from the original four. I think because this one showed Superman as having very human desires. He actually chooses to be with Lois. I still don’t really like her incarnation in this movies… but I love Christopher Reeve’s portrayal of Superman. There’s more action in this movie as opposed to the first, where Superman was dealing with entirely human threats. In this instance, the threats come from Krypton… and the three villains are nasty pieces of work; a bit of a disappointment, since my favourite villains are the ones who have some redeeming qualities. I felt that Superman demonstrated quite a good tactical head, once he realised what was going on. There were some quite clever scenes in this, as well as some particularly sweet ones. Lex Luthor is, of course, untrustworthy… if an amusing character because of the way he is. It was interesting to see him find Superman’s special place and discover more about him, though I was surprised he didn’t take the opportunity to learn even more about his enemy. It was interesting to see how the people of Earth reacted to the threat, especially since they’d become so used to depending on Superman. It was nice to see how much he did care about humans in this movie… a complete contrast to Zod, to whom they were collateral damage. It was interesting to see Superman dealing with being hurt for the first time and how much it shocked him. It was also good to see him react as a normal human to stimulus such as cold. Although the special effects are fairly tame, I think they were pretty good for the time of the movie. It was a good opportunity to see more of Superman’s strength of character… though I could have done without the slightly irritating Lois Lane. I think these films showcase Superman really well… even if they do demonstrate the normal ‘superhero doesn’t get the girl’ cliche that’s so prevalent in anything to do with superheroes. But this movie was entertaining, with clear-cut who the good guys were and who the bad guys were. I plan to watch 3 and 4 in the near future.